Cocktails, Hors D'oeuvres, & Springs Talk! 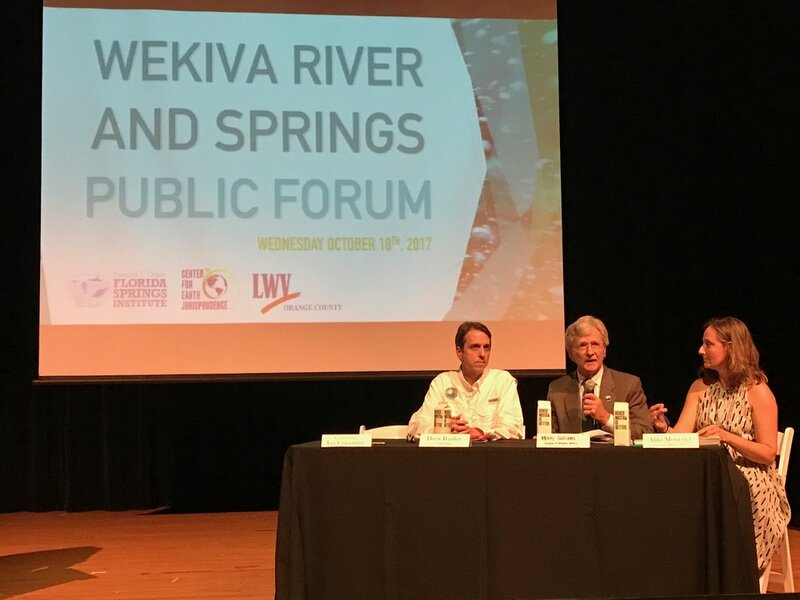 On October 18, 2017, the Center for Earth Jurisprudence hosted the Wekiva River and Springs Public Forum at the Orlando Science Center. 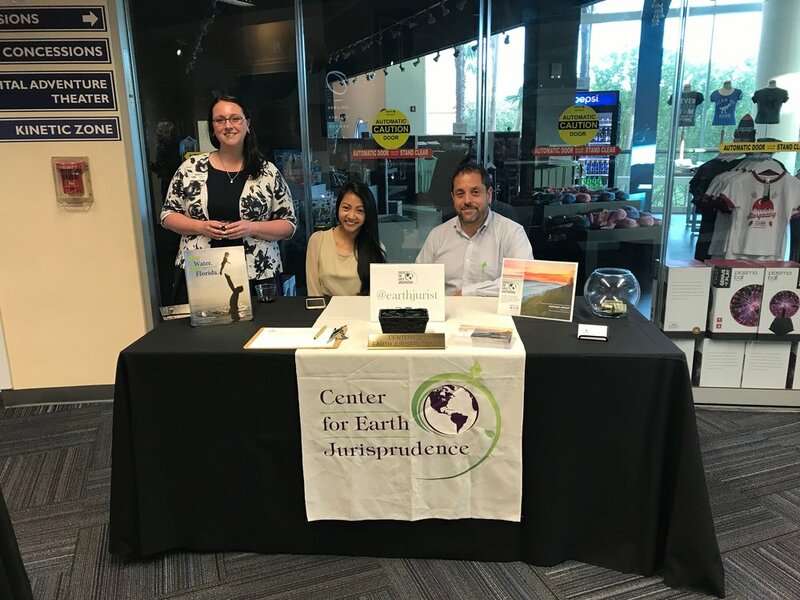 With the Florida Springs Institute and the League of Women Voters of Orange County, CEJ welcomed over 100 members of the community to discuss the current state of our precious springs as well as what legal remedies are available to us to ensure their restoration and protection. Attendees mixing and mingling during the cocktail hour. Photo courtesy of CEJ Fellow Samantha Koempel. The evening began with cocktails, hors d'oeuvres, and lively conversation between local leaders and citizens concerned about the current state of Florida’s springs. Reps from the League of Women Voters! Photo courtesy of CEJ Fellow Samantha Koempel. CEJ Director Margaret Stewart, CEJ Fellow Kathryn Avila, and CEJ friend and volunteer Juan Palerm. Photo courtesy of CEJ Fellow Samantha Koempel. CEJ’s Director, Margaret Stewart, welcomed the night’s attendees and introduced the program, beginning with Dr. Robert Knight of the Florida Springs Institute. Dr. Knight discussed the current state of our springs, specifically in Central Florida, and shared some actions we can all take to help mitigate damage and restore them to healthy levels. CEJ’s Director returned to the stage to explain the legal remedies and protections currently available to our springs and what the requirements are for each. While this discussion was cut short due to time constraints, the overall conclusion was that while the Wekiva River Basin is one of the most heavily protected water bodies in the state, the execution of these protections is still wanting and stronger, more comprehensive approaches are needed. Panelists Drew Bartlett, Marty Sullivan, and Aliki Moncrief. The evening concluded with a panel made up of the Florida Department of Environmental Protection’s Deputy Secretary of Ecosystem Restoration Drew Bartlett, Marty Sullivan of the League of Women Voters, and Aliki Moncrief, Executive Director of the Florida Conservation Voters (Unfortunately, Senator David Simmons was unable to participate as promised). The Panel was moderated by Seminole County Commissioner Lee Constantine who opened with an extended prologue on his work to address the septic tank problems in Central Florida. Following this, the panel picked up with the question posed at the end of the legal discussion: How is the Comprehensive Water Bill working so far? The panel discussed at the length the pros and cons of the Bill as well as the need for proper appropriations of Amendment 1 funds. The questions posed by the audience were indicative of the widespread concern for the health and longevity of our springs. Attendee asking a question of our esteemed panel. Moderator Lee Constantine, Panelists Drew Bartlett, Marty Sullivan, and Aliki Moncrief. Photo courtesy of Katrina Garvin Shadix. 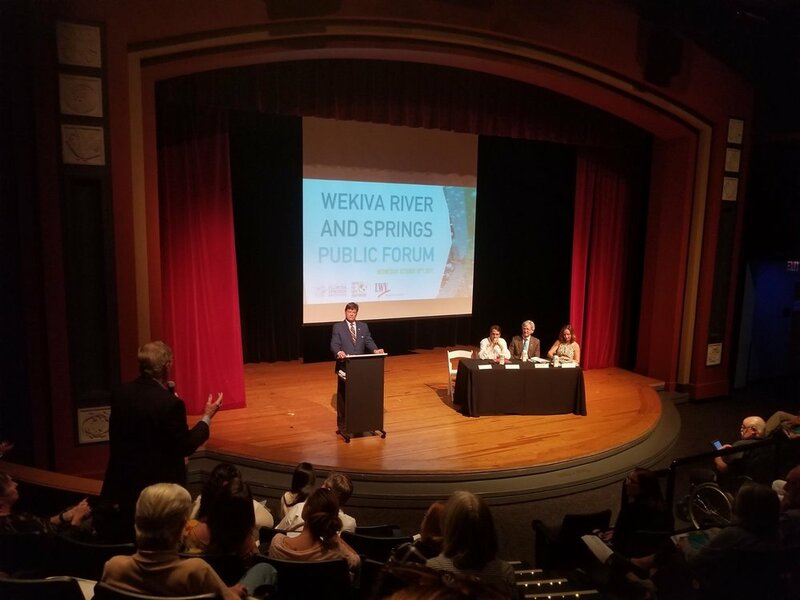 CEJ remains committed to spreading awareness of the problems facing our ecosystem locally, nationally, and internationally through educational outreach programs such as the Wekiva River and Springs Public Forum. Stayed tuned for more programs coming soon! Barry Law Students. Photo courtesy of CEJ Fellow Samantha Koempel. Volunteer Susan Burhoe welcoming our guests. Photo courtesy of CEJ Fellow Samantha Koempel. Barry Law Environmental and Earth Law Clinic students with director, Rachel Deming. Photo courtesy of CEJ Fellow Samantha Koempel.